Prominent & Leading Manufacturer from Coimbatore, we offer aluminium aerial work platform. Built with high-strength aluminium alloy, these mast lifts are in beautiful shape, small size, light weight, stable rising, and safe operation. The mast structure is in good stability, flexible movement. 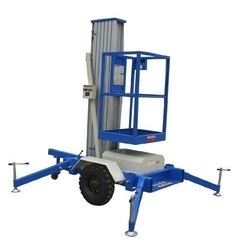 Based on different height and load capacity requirements, such aluminium alloy lifts can be made with one, two, three,, four, five and even six masts. Moreover, for convenience of operation, self-propelled function is designed for it. Machine maintenance, painting, decoration, lamp replacement, cleaning, and installation in workshops, airports, factories, companies, railway stations, docks, exhibition halls.